A small helicopter carrying the only son of WWE owner and chairman Vince McMahon and one other person made a controlled emergency landing in the Atlantic Ocean off Long Island's Gilgo Beach Wednesday morning, prompting a major emergency response, according to Suffolk County officials. Shane McMahon, 47, who left the family business in 2009 and returned to WWE in 2016, chartered the Robinson R44 for a family visit, he said at a news briefing. 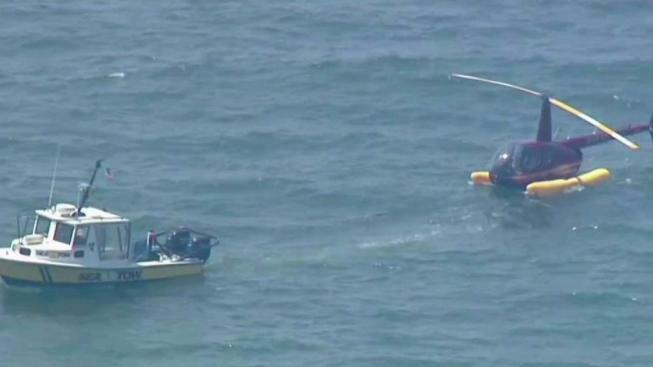 The chopper departed from Manhattan's West Side heliport and flew over the ocean along the south shore before it went down in the water about a half-mile off shore around 10:25 a.m., the pilot and federal officials said. The pilot, Mario Regtien, said he heard a strange noise and it became clear to him he couldn't keep flying the chopper. So he made a soft emergency landing. "Mario was super calm, which made me super calm, and we landed perfectly," McMahon said. The pilot claimed that the helicopter was shaking before it went down. Pei-Sze Cheng reports. "Everything happened so quickly, I didn't have much time to react," he added. But it was still a bit of a scare. "It's very unsettling when all of a sudden you have something happen," he said. "You hear a bang and then you start saying, 'We're going to do an emergency landing in the water,' so it's very unnerving." "We landed softly and checked everything was OK. Everything was fine," said Regtien. "And we waited for the Coast Guard at that point." Authorities say the pilot made a Mayday call just before the emergency landing. A commercial flight heading to John F. Kennedy International Airport heard the call for help and notified FAA controllers, the agency said. McMahon and the other passenger ended up in the water but both had life vests. A kayaker rescued one of them; NYPD divers helped the other. They weren't hurt. The FAA described the incident as a crash, but video from the scene showed the red helicopter resting on pontoons, apparently not submerged. 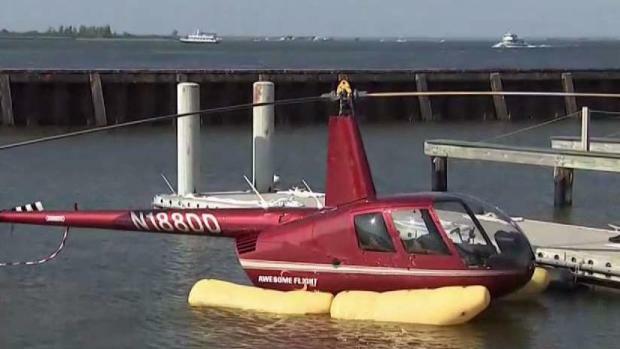 The four-seater Robinson R44 is designed to land in the water, Coast Guard officials say, and the pilot deployed the pontoons to allow the aircraft to land safely. 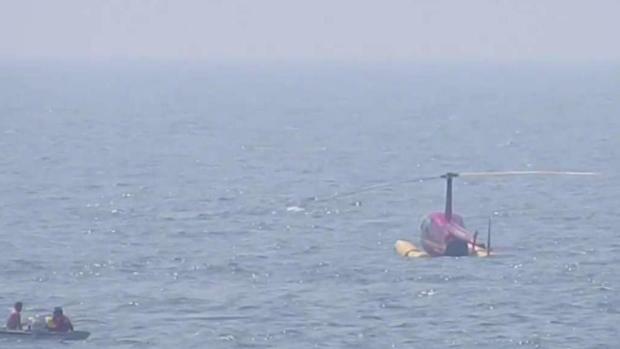 A helicopter made an emergency landing onto the water on Long Islandr. Greg Cergol reports. McMahon thanked the Coast Guard and Suffolk and NYPD marine units, along with other emergency personnel, for their near-instantaneous response. The FAA is investigating. The type of chopper is often used for training, photography and tours. The National Transportation Safety Board has records of 221 crashes involving Robinson R44s dating from 1993 to the present. Two hundred and three people died as a result of those crashes. In the last five years, the U.S. has seen 39 crashes involving that type of chopper, according to federal data.